The Raccoon celebrates the majestic trash bandit, a creature that defies description aside from his dark rogue’s mask and tiny, lock-picking fingers. This badge was a featured reward for our 2017 Monster Scouts Membership Drive Kickstarter. 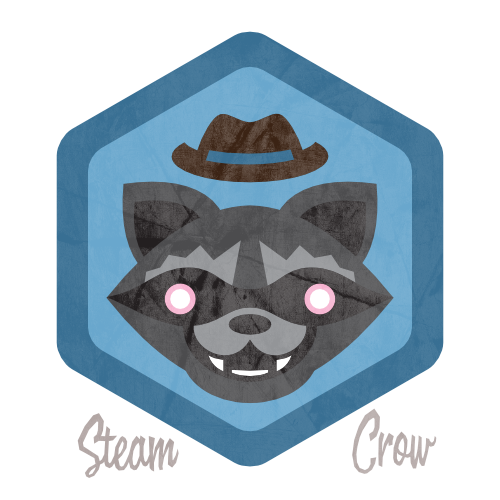 There is but 1 level of the Raccoon Badge, but it’s a damn fine blue! The Raccoon Badge is worth 10 Glory points. Raccoons are seen often in Obscuria, though they usually are wearing old-time hats. (As shown.) The hat symbolizes “the heist” which they always seem to be planning. Convince a Party of Raccoons to give up on the heist. You don’t turn this in for credit; you simply log it into your personal Rangers Sketchbook.